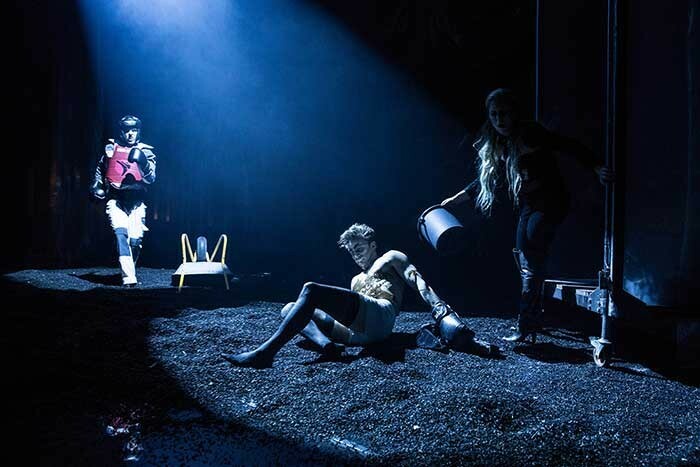 Iceland – Robe moving lights are making a big impact at the Icelandic National Theatre (Þjóðleikhúsið) in Reykjavík since they became an integral element of the available house lighting rig, a process that started in 2014 and has recently been continued with the addition of DL7S Profiles, LEDBeam 1000s and Actor6s. The Robe fixtures were specified by head of lighting Halldór Örn Óskarsson (Halli) and his team of colleagues. 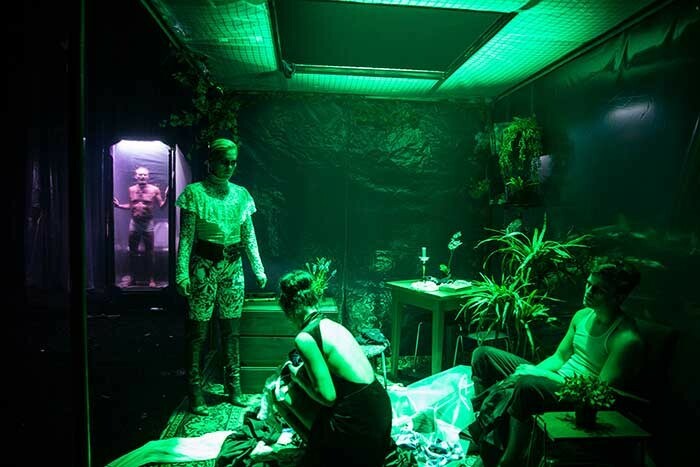 Halli is an award winning LD and also a primary production lighting designer for this high profile venue, which has five separate performance spaces and a busy and diverse programme of shows and events. This includes new Icelandic and international works, Icelandic and foreign classics, musicals, dance pieces and children’s productions. The theatre creates around ten new productions each year and also collaborates with independent theatre and dance groups. Halli chose the new Robe luminaires after having a great experience with their original units, 14 of the first generation DLSs, which were acquired to replace their old FoH lights. The specification was exactly what they wanted, an LED moving head with shutters. He was extremely impressed with the service from the support team from Robe itself and also from Icelandic distributor Luxor, so when the DL7S was launched there was no hesitation in choosing it as part of the next round of purchasing, which was for new overhead rig lights in the Main Stage venue. Seventeen DL7Ss, 25 LEDBeam 1000s and 16 Actor6s joined the rig, replacing a quantity of older tungsten and HMI moving lights from competitor brands. Halli thinks that the DL7 series addresses most of the major issues that were making some theatre LDs reticent about using LED fixtures. “The DL7 fixes both the smoothness of the colour mixing and also the brightness of the fixture,” he commented. He also appreciates the near-silent operation, the excellent colour rendering and the good range of gobos in the profile and spot fixtures in the series. When it comes to LEDBeam 1000s, he likes the excellent zoom range and intense brightness and feels that the colour range is good, even though it’s an RGBW system as opposed to the seven-colour LEDs of the DL7 series. For him, the Actor6 – a static version of Robe’s legendary LEDWash 600 – has: “A great punch,” and its controllable zoom makes it ideal as a side light. The National Theatre is extremely pleased with the new lights which have opened up a whole range of colour palettes and possibilities to light a diversity of productions at the Theatre. Recently he lit a production of Shakespeare classic Othello (Óþelló) directed by Gísli Örn Garðarsson completely with the Robe LEDs plus a few metres of RGB LED ribbon. It was his first fully LED lighting design. Börkur Jónsson’s interesting contemporary set was largely constructed from clear plastic sheaths, so it was a challenge to find the right colours to work with this surface and to create effects that would transform the plastic from transparent to opaque and solid with the lights. There was also a square plastic box that was moved around the stage, so Halli’s starting point was this box being a place of warmth and safety, which was contrasted to the unknown of the outside world, presented as a more dangerous, cold and edgy environment. All the DLS Profiles were positioned on the two FoH lighting bridges and balconies and used for front lighting. The DL7S Profiles were rigged overhead on the lighting fly bars and used as specials, for highlighting set pieces and actors in various places around the stage. They were also utilised for effects like rotating gobos on a tree to emulate its movement in the wind and as green laser lines for a construction site look. The LEDBeam 1000s were rigged on the overhead bars and used for general colour washes on the plastic and as very narrow beams for the gripping end sequence. 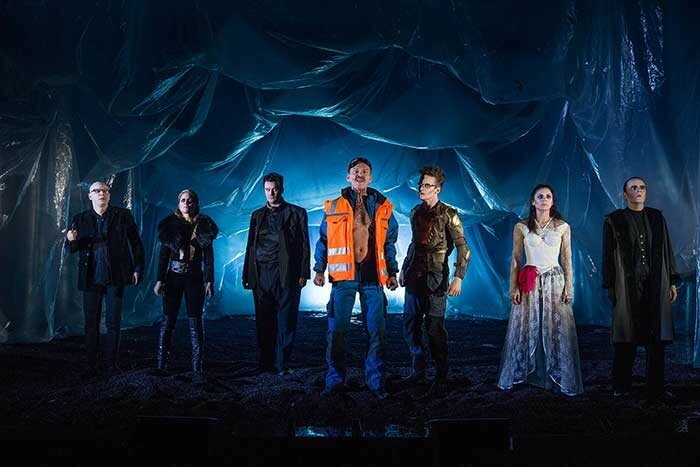 The Actor6s were on 1.7 metre high side booms and on the floor along the back of the stage, where they could wash the entire stage floor and highlight the actors from the side perspective. The black gloss floor completely covered in plastic sheeting was always going to be difficult to light! The wide angle of the LEDBeam 1000s assisted with colouring these expanses of clear plastic efficiently, while the range of hues available from the DL7 Profiles really worked well. The overall very low heat emissions from the lighting rig also helped with the physical installation of the plastic and keeping it in place without stretching. “I felt I was completely covered in all creative and technical aspects using this rig to light this demanding show,” Halli comments. He also programmed it himself, using a grandMA2 light.